Where your Beloved lives forever. Yesterday, I attended a training session for the upcoming Christmas Bird Count sponsored by the National Audubon Society. 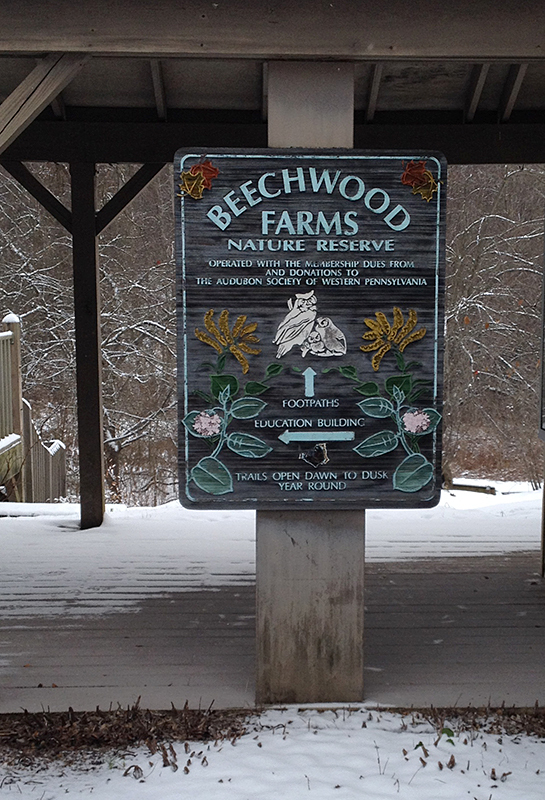 I’ve been to Beechwood Farms Nature Reserve, headquarters of the Audubon Society of Western Pennsylvania, several times this fall to photograph birds and familiarize myself with the walking trails. Fall and winter are great times to film birds as they are more visible in the bare trees and underbrush. After ninety minutes of classroom training, we set out on the trails to practice identification techniques. Although the air was cold, the sky was a brilliant clear blue studded with a few white clouds and a light coating of snow that reflected the morning light and outlined every tree and branch. At the end of a delightful walk on which we observed juncos, cardinals, mourning doves, chickadees and a pair of red-tailed hawks, someone spotted a full V of flying swans high in the sky. We had seen a smaller group pass over earlier in a single line but this second group was huge. True to our training, our guide Gabby studied the birds with binoculars and compared their calls to the bird calls on her Audubon phone app, confirming that they were tundra swans. I later counted 88 swans in the photo of this flying V – a magnificent sight! Here’s a link to the sound of the tundra swan from the Cornell Lab of Ornithology. They have a higher pitched voice than the Canadian goose, with less of a low honk. This entry was posted in Nature and tagged Beechwood Farms Nature Reserve, bird identification, Christmas Bird Count, National Audubon Society, swans, tundra swans by composerinthegarden. Bookmark the permalink. Thanks, Robin. They were probably headed your way; I know they overwinter on the Eastern Shore. I hope I get to see them again when they return and bring spring with them! Isn’t that the great thing about birds – you just never know what you will see, and where! I wish children were made to attend such workshops. It would sensitize them so much towards nature. Loved your photographs as well. Sanchita, thank you for stopping by and commenting! You are so right about the importance of helping children connect to nature. Actually, the education staff at Beechwood Farms does a lot of work with school children. While I was there that day, there were several children inside counting birds at the feeder watch and they seemed to be enjoying themselves immensely. Lynn, I loved seeing what you viewed along the trail with the snow. And the video of the swans in formation is very cool. How could you count that many swans in such a short time? Great post! Margie, it was one of those perfect days. I actually had to create a still image from the video in order to count the swans, then I shared it with the people at Beechwood for their records. As close as we could determine there were between 88 and 90 swans – a “wow” moment for sure! There is nothing more amazing than having ones attention drawn to that v formation high up in the sky. We see sand hill cranes twice a year as they move north and south. Wow indeed. Flocks of hill cranes must be very impressive! Thank you for stopping by, Rock Rose – I have been enjoying your blog immensely! And to you and yours, Frank! I looked up the other day and saw an ordinary flock of geese flying in formation and was awed. I can’t imagine seeing a flock of swans. Magnificent! Have a very Merry Christmas, my friend, and a truly peaceful and prosperous New Year. Eleanor, I just posted on your site (synchronicity!). I downloaded the Kindle edition of your book and read it last night. I am so in awe of you, a living example of the importance of personal “sass”! I have so many thoughts to share, but for now, a very Merry Christmas and abundant blessings for the New Year! What a great walk, and that’s a LOT of swans! Happy Holidays, Lynn! Thanks, Tracy – glad you joined me! Have a wonderful holiday too! What a treat to have seen them. I guess it was tough to any up close? HI Jean! The swans were very high overhead, perhaps because of their great numbers. I would have loved to see one closer! stunning and what a gift. thanks for sharing your video with us. Love the idea of learning more about identifying for the bird count. and our winter photography is very beautiful especially the water reflections. CheyAnne, it is always a pleasure to visit your blog; I love your work! There is probably an Audobon sponsored Christmas Bird Count near you; I learned a lot from the workshop and will probably learn even more when I go out in the field with real bird watchers! Glad you enjoyed the video; it was quite an experience. A beautiful set of photos. That “Earth Water Sky” shot is a magnificent picture. Chris, that is my favorite shot too – thanks for visiting and commenting! Thanks for stopping by, diversifolius! I’ve never seen swans here before; our guide said that they were heading to the coast where they overwinter. We’ve already had several early snows here, so it may be a good winter for snowfall. Snow cover is good for the garden, terrible for driving! If we get as much snow this winter as we got rain in the summer, it will be interesting, to say the least. I’m putting snow tires instead of all-season tires on my car later this week – just have that feeling . . .
loved the “wow” in the video. It’s how I often feel in nature “wow”. there’s something particularly lovely about a cold, crisp winter day. So used to seeing geese in flight, somehow never thought about swans in formation like that. What a thrill to have seen them. Joss, I loved that “wow” too – so spontaneous and genuine! I too am used to geese; they pass over our neighborhood all the time, but I’ve never seen swans before. They sound different than geese as well, a higher pitch and not that low honk; I added a link above to their sound at the Cornell Lab. How fabulous that you happened to see the Tundra swans! And get the pictures! Such a huge V! A gift I know you feel privileged to have seen. They’re so beautiful – they’re one of the pleasures of living out here. I never saw them back east, but I can here, in the winter. I hope you let us know what you see on the CBC. And what you hear! I’d love to know your thoughts about some of the bird calls you hear. It is the first time I’ve ever seen these swans, Lynn, and such a spectacular group! Yes, I hope to report on the CBC around New Year’s. I’m not sure if I will get sound since people tend to chat in groups but I might get lucky; I plan to take my special field mic with me. I may also upgrade my monopod so that I can shoot quality video on the go rather than just still photos. O the wonder of winter! Whoever said wow in the video had it right. Wow! Cheers to your bird count efforts! Thanks for sharing the good winter pics! …. Hi Lynn! Thanks, Frank; I’m looking forward to the experience! Beautiful Lynn. I particularly love the teasels in the snow. Thanks, Audrey! The teasels were beautiful, swaying in the wind – I got a short video of them as well but want to go back with my good camera next time. Glorious! Thank you so much for capturing and sharing this, Lynn. How beautiful. Moved to tears. Just glorious. I hope they have a safe flight. Such blessing! Thanks, Kitty; it really was glorious and something I have never seen before. The perfect ending to a great morning and a lovely start to winter. Amazing! I’ve never seen that many birds of any species in a V, never more than two dozen. Good luck with the Christmas Bird Count! I usually do a small version at home or on the trail in an afternoon. We get Canadian geese flying overhead here quite often but I’ve never seen the swans before. The first flight that went by had about 22 in a single line, but the second V was spectacular! I’m looking forward to the bird count; something new to me. The swans in flight–that’s quite a sight, Lynn. I’ve never seen that many swans in a flight pattern. 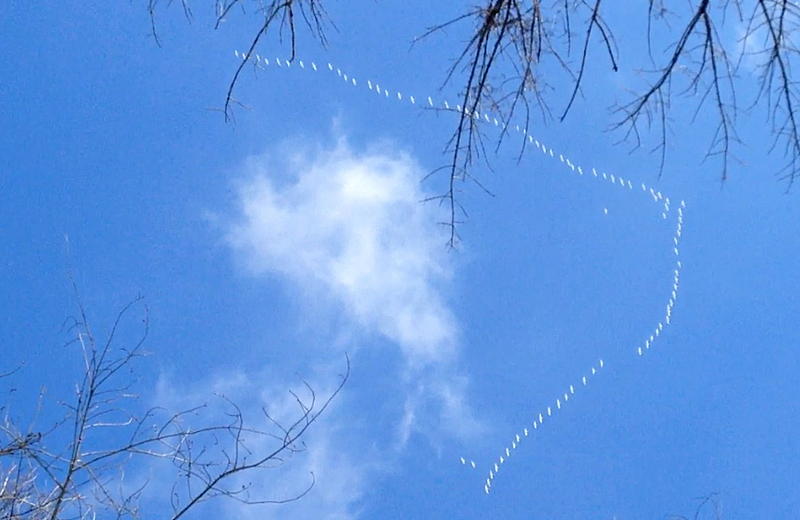 (I think the most I’ve seen in flight…a couple of dozen or so Trumpeter Swans.) Thanks for sharing the images and the story. It was quite a sight, Kerry – I don’t think I’ve ever seen any in flight before. The formation was magnificent. Thanks for stopping by. What a fantastic sight those swans must have been. Wow, indeed. It was, Tootlepedal – I count myself lucky to have seen them!